If you are searching for ways of changing euro coins then look no further. Cash4Coins can assist with all your needs for foreign currency exchange. Many people find themselves with lots of loose foreign currency lying around their houses, following years of trips and holidays abroad. They feel at a loss with what to do with the Euro coins, as most banks will not accept or exchange foreign coins it due to the high costs they incur in doing so. Cash4Coins provide a very comprehensive and professional service when changing euro coins and indeed any other currency or old out of date notes you may find yourself hoarding! Where the banks won’t help you, we will! And our service is fast, effective and ready to use right away. We won’t even ask you sort or count your own coins as we do that for you. Aren’t we helpful? It’s all part of the service and a service that we think you will find incredibly useful. It is really very simple, all you need do is send the coins to us at our address, we will even collect your Euro coins free of charge if your coins weigh more than 5kgs. The coins will then be counted and recounted by our team of experts who will then send you an offer for your currency, if you accept our offer you can expect to receive payment within about an hour! In the event that you don’t accept our offer we will return the currency free of charge, so there really is nothing to lose! Check out our customer comments page to see what our clients are saying about us. Foreign coin collections are also becoming more and more popular as a way of successfully fundraising. We are receiving a growing number of enquiries from large charities and organisations looking to raise much needed funds through a foreign coin collection. Why not ask for leftover foreign coins to be donated at your next charity drive or event? You will be surprised how many people have them knocking around in the backs of drawers or in jars. 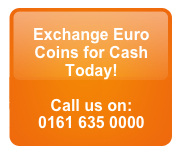 We make changing Euro coins easier than ever and we are sure you’ll welcome the cash boost this gives your charity. Alternatively take a look at our page ‘How to send us coins‘ We really do make it easy to send in your coins. Once we receive them we’ll sort and count them and send you a valuation. If you agree to this valuation, we’ll send you the cash. It really is that quick and simple. Changing Euro coins was never easier and our friendly and helpful team will be happy to exchange your foreign currency today.